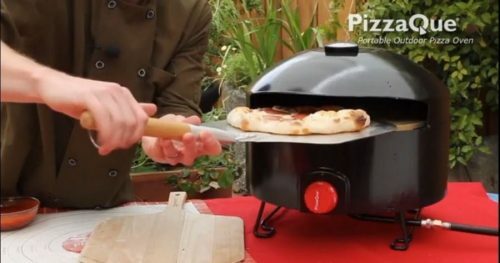 Why a Standalone Outdoor Pizza Oven? Let me guess, you’re here because you love pizza. And when you say you love pizza, you aren’t talking about the freezer section instant, the papa anything delivery, or the take and bake. You love real pizza – real ingredients, the beautiful blistered crust, the molten pools of bubbling mozzarella, that smoky tinge you can only get from a wood-fired, brick oven. Is it possible to get this kind of goodness in your backyard? Let me rephrase that. Is it possible to get this kind of goodness in your own backyard without taking out a second mortgage on your home? Fortunately, it is. 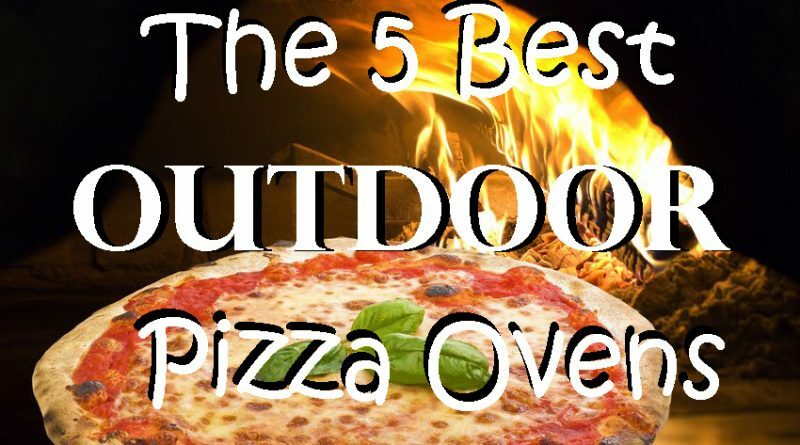 Looking for the best outdoor pizza oven, I’ve reviewed five popular (and inexpensive) ovens that will have you rivaling your town’s best pizzerias presto. 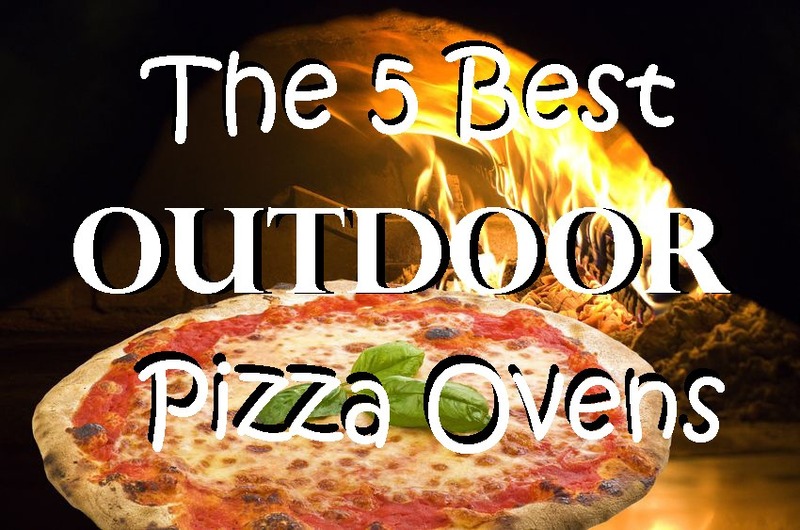 I looked at the PizzaCraft PizzaQue PC6500, the Camp Chef Italia Artisan, the Cuisinart CP-640 Alfrescamore, the Blackstone Outdoor, and the BakerStone Gas Pizza Oven. To help you make a better educated decision, I looked at the internal temperature (especially whether or not you can reach the ~900F mark to make the specialty Neapolitan style), time for preheat, size of stone and accessories, and the price. And as long as I’ve mentioned price, the advantage of a good pizza oven is that they pay for themselves. A few happy reviewers of these ovens did the math. Some of them said that after one pizza party they had saved one fourth of the price over ordering from their favorite restaurant. Three more like it, they said, and the pizza oven paid for itself. So, read on, fair signore or signora… and dream of pizza! While definitely giving a bit of an R2D2 vibe, this propane-powered, 14,500 BTU outdoor pizza oven is the model of simplicity — in a good way. It’s fast, it makes outstanding pizzas, and well, that’s it. But really, what else were you looking for? Currently only $145 on Amazon.com, the PizzaCraft PizzaQue is the cheapest model I reviewed. Many times you get what you pay for, but here, this doesn’t hold true. 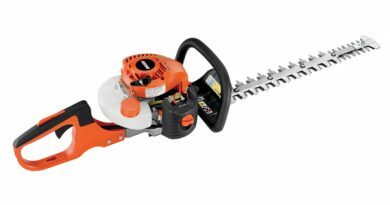 This model got some of the highest reviews on Amazon and seemed to provide the most consistent results. There aren’t a lot of bells and whistles (in fact, there are no accessories included, whatsoever). But this often means that there are fewer things to break. Going back to the days when we all lived in caves and cooked meat over fire, this oven takes a propane flame, and heats up a pizza stone and a small grill area. Pretty simple. And in this case, the simplicity is its beauty — because there isn’t much beauty elsewhere! Using a single 20lb propane tank (not included) you can cook over 250 pizzas (not at the same time) on its 14” cordierite stone. 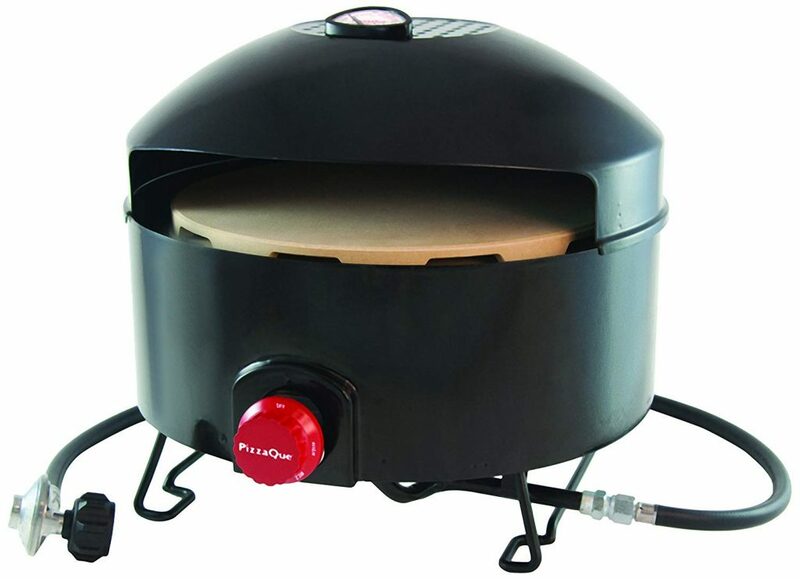 The powerful burner takes only 15 minutes to get up to its advertised 700 F cooking temperature. At this temperature, a perfect pizza is only 6 minutes away. I like the simplicity. 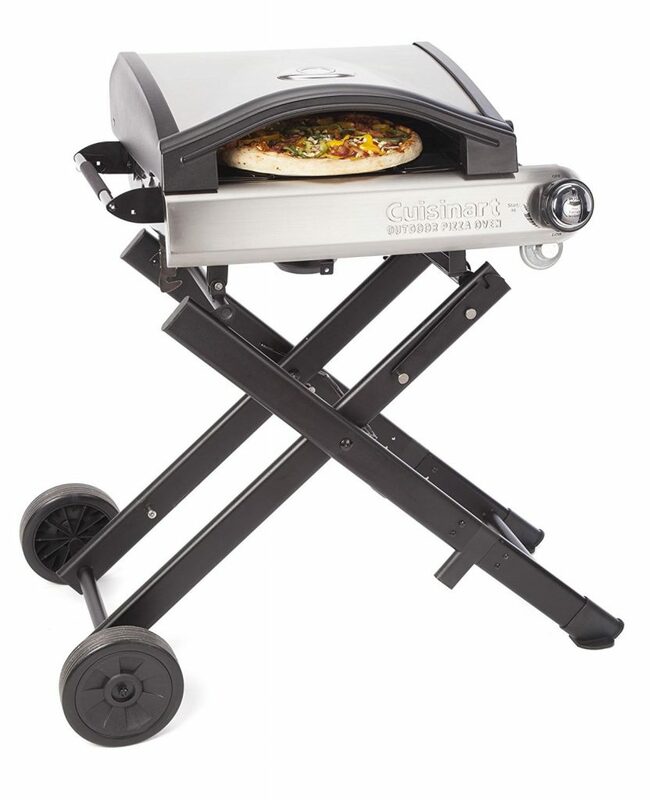 This is a lightweight, portable, easy assembly outdoor pizza oven. If you want to take this camping or to a picnic, don’t stray too far from your vehicle, though. The oven, weighing in at 26 pounds, plus a full propane tank gets heavy quickly. I am amazed at how fast this preheats. Assuming good protection from wind (see disadvantages below), the PizzaCraft PizzaQue easily reached the advertised 700 F, and sometimes higher, in 15 minutes or less. This is plenty hot to cook almost any style of pizza in a short time. Though the manufacturer recommends turning the pizza once — 180 degrees at 2-3 minutes — to get the best results, it should be turned more often. The 14” cordierite stone gives a wonderful, pizzeria-style crust. Again, though it is not in the instructions, it is recommend to sprinkle with some cornmeal or polenta to prevent sticking. This wasn’t a big problem, but it makes moving the pizza much easier. The advertised temperature and preheat time depended a lot on perfect outdoor conditions. There is no door and, as a result, any wind can make keeping the required internal temperatures difficult. Some people even constructed a makeshift metal door just to block the wind. Low ambient temperatures can also affect performance. Speaking of temperature, this model does not seem capable of reaching the scorching hot, 900 F temperature required to make the Neapolitan-style pizza. It will cook everything else, but if your refined palette requires the ability to master every pizza style, you’ll have to keep looking. Like just about every grill on the market, the included temperature gauge is inaccurate. You should never rely solely (or at all) on the included thermometer. I recommend purchasing a digital thermometer or an infrared laser thermometer to verify your temperatures. It is a bit difficult to maneuver inside the oven. This is a very small oven. The largest pizza you can make is 13 inches, but at that size, it is difficult to throw the raw pizza, turn it, and remove your perfectly crafted creation. Let’s just say, it won’t look good on Instagram the first time you try it out. In addition, you will have to purchase a thin metal pizza peel. There is not one included. And wooden peels, though they look authentic, won’t fit inside the oven. 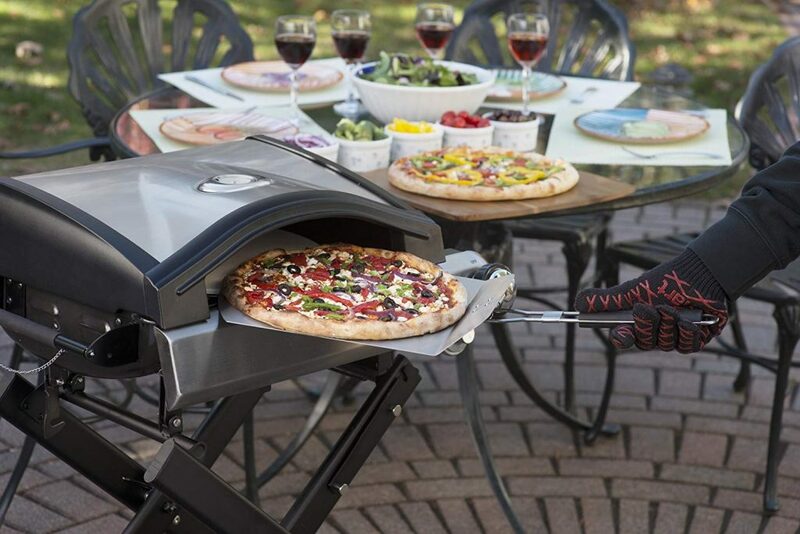 Overall, this outdoor pizza oven has received great reviews on Amazon (4.7 out of 5 stars). After going through a small learning curve, many people really loved the PizzaCraft PizzaQue. A vast majority gave the full 5 stars. Importantly to you, pizza lover, the reason this pizza oven got the high ratings was because, as long as it was protected from the wind, it consistently made great pizzas. Some reviewers have made hundreds of pizzas in this oven without any problems. I think that any concerns with its appearance, internal size, or inaccuracy of the thermometer are outweighed by its simplicity and results. And results — we like results. Particularly when results end in delicious pizza. Looking for that best pizza oven style pizza? Then the Camp Chef Italia may just need to be your next purchase. 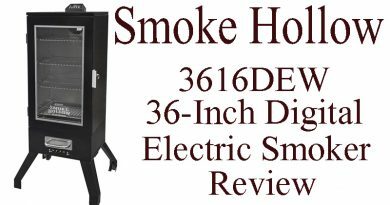 The doubled-walled, heavy duty construction is designed for extra thermal mass to replicate the brick-oven pizza ovens you have learned to love. The “camp” label and the small propane bottle hookup, I suppose, means that this can be a portable camp-stove. But this 17,000 BTU per hour beauty weighs in at a hefty 47 pounds without the gas tank. And for this camper at least, it would probably have to stay home. And that’s okay — The Camp Chef Italia looks nothing like a camp stove. In fact, its stainless steel rounded top and minimalistic design is a nice addition to an outdoor patio area. Besides, with as much as you’ll be using this, you’ll want it easily accessible for any sudden pizza cravings. 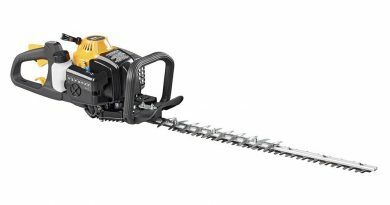 At $259.17 on Amazon.com, this was about the middle price of all I reviewed. Yet for the money, you get some welcome extras. This is a simple to use, hot-fire, hot pizza stone oven. Simply preheat for 15 minutes, add your toppings to your favorite dough, and then cook. Don’t wander too far during the cooking time, however. At 700+ degrees Fahrenheit, your pizza will be bubbling hot before you know it. I like this particular model because of the nice fusion of form and function. Unlike some of the other pizza ovens I reviewed, the Camp Chef Italia wouldn’t look out of place in a backyard patio kitchen. Some Amazon reviewers suggested an aftermarket cover to protect this beauty from the elements. What I really liked was the included 5 foot hose for the 20 pound propane tank. 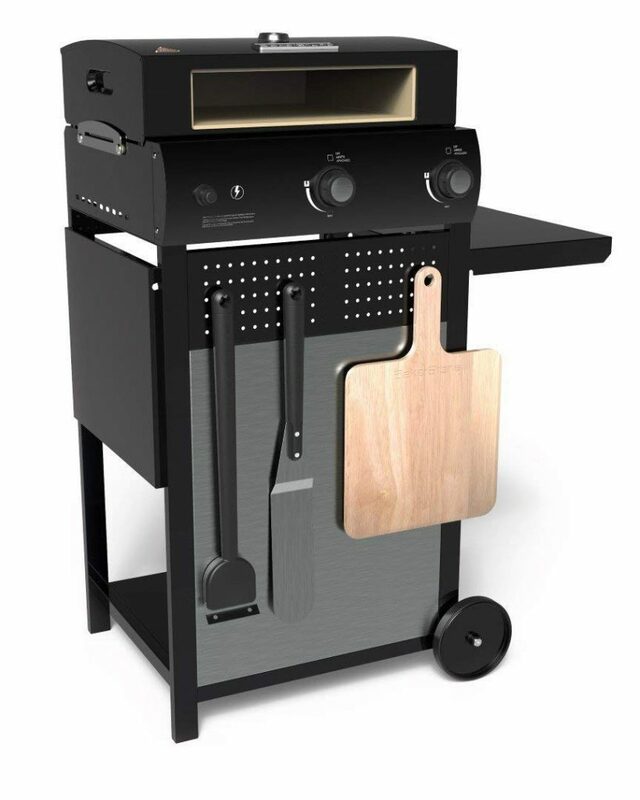 While the one pound bottle may be what makes this the camp model, the small tank simply doesn’t have enough punch to sustain the scorching temperatures you need for that perfect pizza. This extra hose should be an option on all of the models (I’m looking at you, Cuisinart Alfrescamoré). If you are looking at this because the “camp” name has you envisioning baking perfect pizza out in the wilds of your favorite national park, unless you spend your free time curling beer barrels, this is going to be heavy. I can see it working at a site where you park right next to the picnic tables, but anything further, and this is just going to be a bear. Though, come to think of it, brick-oven style pizza under the stars sure beats hot dogs on a stick. Hmmm… maybe it’s time to start hitting the gym. There were a lot of complaints about the inaccuracy of the built-in thermometer, varying wildly from the actual temperature. I think that any built-in thermometer just isn’t going to be as accurate as you can get with a good digital or laser-infrared model. Get a good one and use it for your pizza oven, your grilling, baking, and everything else that you need. If you are making good food, using good ingredients, and doing all you can to impress the neighbors, there really is no excuse not to have accurate temperature control. You’ll thank me. There were some complaints about missing hardware — a screw, a handle, etc. — and lack of durability. Some Amazon reviewers had problems with the auto-light (like any gas grill, it is possible to manually light) or the gas regulator. Both of these are easy fixes or workarounds, but they happened enough to warrant mentioning. Finally, at an advertised max temperature of 700 F (though some reviewers claimed to have gotten higher), this isn’t quite high for the Neapolitan-style pizza. Those who are looking for that particular benchmark will have to keep looking. But for the rest of us who simply love great pizza, this temperature is just fine. The Camp Chef Italia is an excellent pizza oven. I got 4.5 stars out of 5 on Amazon.com. There was even a detailed review by a pizza restaurant that uses this pizza oven to cook hundreds of pizzas in a row for outdoor festivals. That speaks more to me of its durability than anything else. The double-walled construction, which is the cause for the increased weight over other models, increases the thermal mass of the oven. And this extra mass is what radiates heat back to the top of your pizza. A hot stone, a hot oven, and delicious ingredients are like when the stars line up. You put those three together, and you can’t help but make an excellent pizza. Alfrescamoré, Alfrescamoré, I can say that over and over in my best (bad) Italian accent. And the Cuisinart Alfrescamoré is a thing of beauty. Its smooth curves and generous trim will make you the envy of all your friends — and that’s just the beginning. When they taste the smoky flavor and see that crispy crust of the pizza that emerges, they will be friends for life. The Cuisinart Alfrescamoré isn’t just a thing of beauty. Packing 15,000 BTUs of pizza perfecting power, your perfect pie is ready in as little as five minutes. Alongside of all that power, is an integrated smoker cup that you can pack with your favorite hardwood chips to truly give the smoky accent that is definitely lacking on the propane-only stoves. Those gentle curves hide some problems, however. The small bottle of propane that this uses isn’t powerful enough for many users to get much higher than 500 F — much lower than the other pizza ovens I reviewed. In addition, some of the plastic that looks so nice out of the box (handles and trim) is too close to the hot surfaces and has melted. Neapolitan style? – Not even close. I love the foldaway stand for this oven. 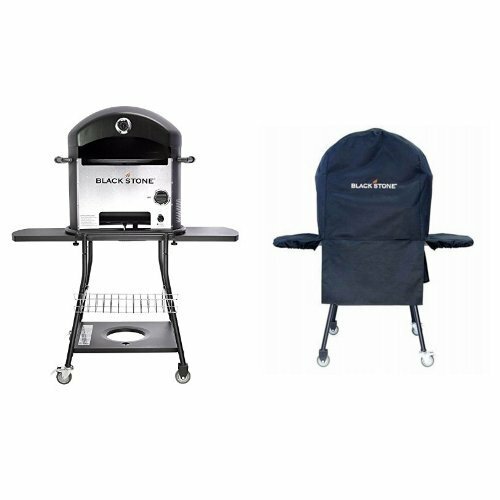 Its locking collapsible legs and side handles actually allow it to be rolled out for your backyard barbecues, tailgating, parties, picnics, and camping trips. Some of the other models are just heavy, and depend on finding another stand or open space to set. I like that this one has it included. This is an easy pizza oven to use. It has a piezoelectric starter — no matches or lighters needed. Just turn on the gas, hit the ignitor, wait 15 minutes to preheat, and you are ready to cook. Simple. I like simple. The hinged lid is a great idea for easy access to your pizza. Many people mentioned on the other models the difficulty in maneuvering in the small opening. However, great pizza depends on the radiant heat that builds up within the oven. Every time you open the lid, you lose all that precious heat. Use this feature with care. This one comes with a pizza peel. I don’t know how many of you have tried moving a floppy uncooked pizza to an outdoor oven without one, but it is a recipe for disaster. Including one in the box gets you up and running. The one advantage that sets apart the Cuisinart Alfrescamoré for me is the smoker cup. I’m pretty sure that you are looking at pizza ovens because you love the taste of a local pizzeria that, chances are, cooks their pizza in a wood fired oven. That gives the crust a smoky flavor that simply can’t be replaced with propane. Fill the smoker cup with your favorite smoker wood chips, and you are that much closer to the authentic flavor you’re looking for. In their attempt to make this pizza oven perfectly portable, I think they made a mistake with only offering a hook up for the small propane bottle. Many reviewers were unable to reach the temperatures advertised. There is a good reason for this. *Science alert! * As the liquid propane evaporates to provide the gas to burn in the oven, it cools down. A lot. As it gets cold, the ability to produce more gas diminishes. Eventually, it gets so cold that there is not enough propane evaporating to keep the oven at its required temperature (I like at least 700 F). Some reviewers were finding temperatures only in the 350 – 400 F range. I believe that is because of the decreased gas pressure in the small propane bottle. Is there anything you can do about it? Yes. You can buy a propane tank extension (which comes with the Camp Chef Italia Artisan Pizza Oven), and use a large propane tank. This should allow far more propane to flow and achieve those higher temperatures needed for great pizza. No more science, I promise. Another disadvantage is some shoddy construction — particularly plastic where plastic shouldn’t be. The top lifting handle (plastic) is screwed on with a brass bolt. When that brass bolt reaches 500 degrees, the plastic melts, and the handle falls right off. Finally, many reviewers who cross-checked the included thermometer found it to be wildly inaccurate. You’ll need to get a digital or infrared thermometer to ensure you are at the right temperature for your style of pizza. Plus you can use it for your grill, oven, and anywhere else you need to actually know what temperature your food is — rather than relying on a cheap dial. Well, it looks nice. And even at 350 to 400 F it will cook a pizza. Just like your oven will. But that’s not why you are buying a stand-alone pizza oven. With 3.8 out of 5 stars, many reviewers were less than impressed. Also, unless you are handy and want to replace the gas regulator, it’ll get hot enough to melt cheese and cook dough, but it won’t make as good a pizza as you’ll get in the 700 F range. Oh yeah, and while you have your tools out, you’ll have to fix a handle and some trim when it melts. 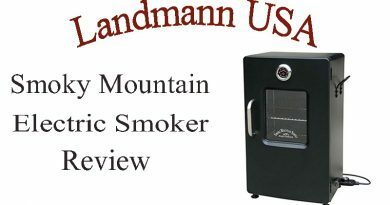 It’s a nice looking oven, and I love the smoker cup and stand. But for the money, there are better options out there. In addition to the crazy hot temperatures, the Blackstone Outdoor comes with a rotating pizza stone able to handle 16” large pizzas. When it comes to making pizzeria style pizza, temperature is king, queen, duke, duchess, and everything else in between. And the Blackstone Outdoor is the reigning champion. If you want that crunch on the outside of the crust and retaining the chewy inside, (plus that subtle, oh so beautiful black char) you need this kind of heat. In fact, for many reviewers, rather than having to work around to increase the heat of the oven, they had to reduce the temperature to keep it from burning. At 900 F, you can cook every single pizza style (including Neapolitan) — even with the delicious 00 flour. And cooked at that temperature, your pie is done in a minute, even with raw meat. That’s hot. I have to say that again — one minute between you and a piping hot pizza. That’s incredible. Time and time again, reviewers said that this made great pizza. The rotating pizza stone is an advantage, well, because 900 F is eyebrow singeing hot. You don’t want to have to get too close to turn a pizza. But, this motor has had some problems. See below. The wheeled cart is great. At 117 pounds, you don’t want to have to call the high school JV football squad every time the pizza cravings come. Speaking of 117 pounds, this pizza oven has plenty of the all-important thermal mass to radiate the heat to the top of the pizza. The stone is plenty hot, but it needs this even heat distribution so that your toppings cook without the crust burning. Staying on the theme of weight, this is a heavy, heavy box. If it is possible beg, plead, or bribe the delivery person bring it all the way to where you are going to assemble it. That might be worth a $10 tip. Lugging a 100 + pound box off the front porch and around to the backyard isn’t my idea of fun. And assembly is a definite disadvantage. This is a complicated process. The instructions are clear enough — and there is a QC code you can scan for a video to help. But even a video might not be enough. From some reviewer’s experiences, MacGyver might not be enough. Many Blackstones came with bent legs that needed to be hammered into place. Others never were quite level to the ground. And that brings us to the rotisserie motor – great idea, poorly executed. For many reviewers, it broke after only a few uses. For others, it mounted crooked when it was assembled. As a testament to how popular this pizza oven is, however, buyers went to great lengths to repair the motor, installing high quality bearings, and one even going as far as to replace the whole motor with an aftermarket one. It sounds like Blackstone is making some attempts to respond to these complaints. The newest models are now shipping with high quality thrust bearings instead of those originally installed. A final complaint was the incredibly persistent sticker residue left behind from the Blackstone sticker on the front of the oven. Rubbing alcohol seemed to be the best fix, though it still took some elbow grease to fully remove. The Blackstone Outdoor is an excellent pizza oven — once you get it put together. Nothing I reviewed could match the scorching heat necessary if you want the ability to cook every style of pizza with every grind of flour. Once the oven was assembled, there were few problems with this oven. The reviewers gave it, on average, 3.9 stars out of 5. They appreciated the simple operation, the extremely powerful burner, and the high temperatures. If Blackstone continues to respond to their customer’s complaints, this will be hard to pass up. In fact, you probably shouldn’t pass it up. The BakerStone Gas Pizza Oven is a 25,000 BTU re-working of their original grill-top pizza oven box. The BakerStone started as a crowdfunded way to turn a regular grill into a home pizzeria. Reception was great, and it has won multiple retail and consumer awards. By adding a simple propane gas burner, they were able to make their original model into a stand-alone pizza oven. 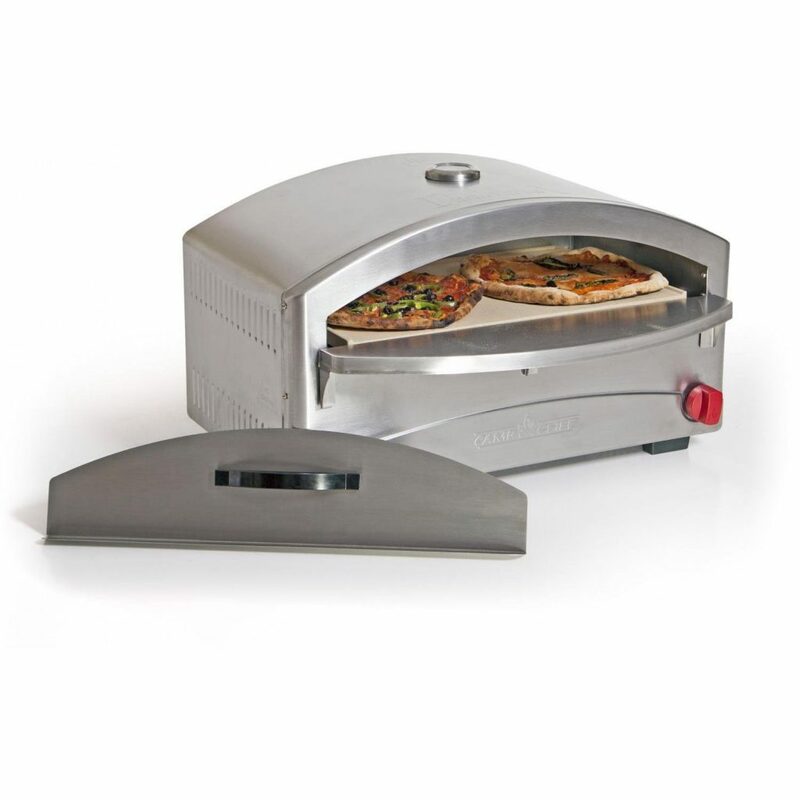 The original grill top pizza oven box has received tremendous reviews. Some reviewers have been using theirs several times a week for years. This is a well-built, simple system that just makes good pizza. What makes this great is the double-walled, cordierite-steel box. It uses a combination of convective, conductive, and radiant heat to quickly seal in the moisture inside of the crust (conductive and convective heat) and ensure that the toppings cook (radiant heat) in the same amount of time. If one of these is hotter than the other, you end up with a burnt crust or undercooked toppings. You never knew pizza was such a delicate science, did you? The BakerStone uses the thermal mass of the refractory stone (the top alone weighs 30 pounds) to ensure an even heat throughout. This oven has the advantage of simplicity of design. It is a box with plenty of thermal mass (which provides the radiant heat necessary). While it doesn’t get as hot as others (the Blackstone Outdoor notably), 800 degrees Fahrenheit is still very hot. It will cook your pizza in a short amount of time, that’s for certain. Speaking of design, it looks nice. I wouldn’t go as far as to say beautiful or elegant, but it has a nice finish to it and looks well constructed. I like the cart with collapsible trays. You can never have enough countertop space when cooking outdoors (especially pizza). In addition, there is ample space to hang your accessories, like your much needed pizza peel. This product takes some assembly (About 20 minutes). And there is the fear of breaking the cordierite stone box. You can’t repair it, and they don’t sell replacement stones in this shape. So be careful! There is no thermometer at all. (There is a little gauge on top that shows cold, preheating, and hot – but that is horribly imprecise) As on the other reviews, I suggest buying a good digital thermometer or an infrared thermometer. They are far more precise than what comes with a grill, and you will be able to use them for all of your cooking and grilling needs. At 800 F, this pizza oven will cook most styles of pizza. The artisanal crusts that are the rage in the New York pizzerias need at least 100 degrees more than this provides to get that 60 second cooking time. If that is important to you, this might not be the one you need. Though this has a wider opening than some, it is still difficult maneuver inside. And without a hinged top, cleaning can be difficult — and it should go without saying — should be waited until after it is cooled! But remember, some char from previous pizza experiments (both successful and less than successful) just add to that delicious grill-seasoning of all your future culinary creations. consumers when it was simply a grill-top box. The offering of it as a stand-alone gas oven may just make a good product better. When looking for the best pizza oven, simple heat is often best. I love the cordierite box that surrounds the pizza with all three types of heat (conductive, convective, and radiant heat). Preheat, prepare the pizza, cook, and eat. Rinse and repeat. Enjoy the pure bliss that follows. That being said, many people were very happy with the box that sat atop at least a 3-burner grill. 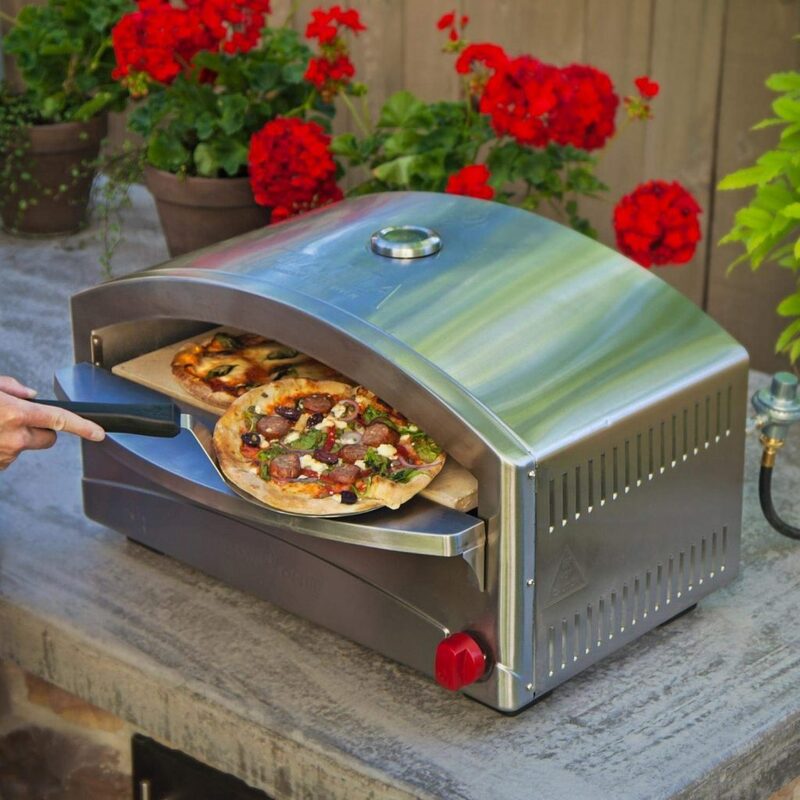 If you don’t need yet another contraption taking space on your patio, perhaps the BakerStone Pizza Oven Box is a better and inexpensive choice for you. The product is a well-made pizza oven that, after some careful assembly, performs well for a majority of buyers, receiving 4.2 stars out of 5. And by “performs well” we, of course, mean that it makes good pizza! You better cut the pizza into four slices. I’m not hungry enough to eat six. However you slice it, for those who are looking for the best pizza oven, you have started the right journey. Pizza cooked on a scorching hot pizza stone simply is better than in an oven. And there are a lot of great choices (that won’t break the bank) for making pizzeria-style pizza in your own backyard. 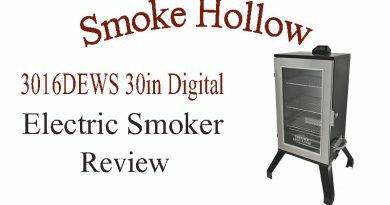 You can have simple and inexpensive (the PizzaCraft PizzaQue and the Camp Chef Italia Artisan), or the blazing inferno (Blackstone Outdoor) that can handle everything from a freezer section premade (not recommended) to the newest artisanal crust coming out of New York City (yes please!). Some have stands for ease of storage and access (Cuisinart Afrescamore, Blackstone Outdoor, and BakerStone Gas). A few style themselves as, sort of, portable (PizzaCraft PizzaQue, Camp Chef Italia). I hope this guide is helpful in making your decision. But remember, the best tool in the world, or the best pizza oven in the world can’t replace experience cooking. So whatever you decide, get out there and cook wonderful pizza! If only all practice produced such delicious results!